Donald Trump, flanked by Ford CEO James Hackett and White House chief economic adviser Larry Kudlow, meets with chief executives of major U.S. and foreign automakers at the White House in Washington. WASHINGTON — President Donald Trump told leaders of the world's top automakers on Friday that he wants to see more cars built in the United States as his administration weighs plans to reduce gas mileage and pollution requirements enacted during the Obama administration. As the auto executives introduced themselves, the president joked to Sergio Marchionne, the chairman and chief executive of Fiat Chrysler, that "right now he's my favourite man in the room" because he's moving truck production from Mexico to Michigan. The plant in Mexico will remain operational, building future commercial vehicles. Canada recognizes U.S. fuel economy standards, so any changes south of the border would likely be implemented in Canada, too. 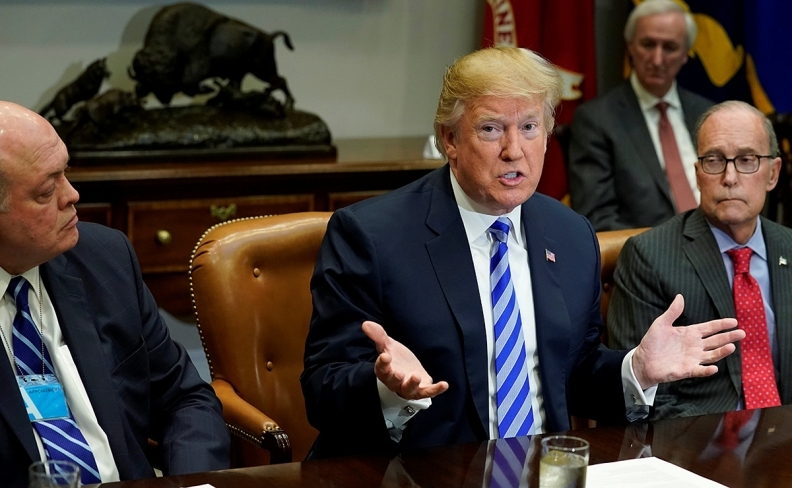 Ahead of the meeting, the White House said Trump would discuss with the CEOs the impact of the rule-making on the auto industry and their efforts to negotiate a 'National Program' with the state of California. The meeting included Environmental Protection Agency Administrator Scott Pruitt, Transportation Secretary Elaine Chao and other officials. If California splits from the federal rule, it likely would be joined by 12 states that follow its standards. Together they make up about 40 per cent of U.S. new-vehicle sales. Requirements now are lower for bigger vehicles such as trucks and SUVs, said Luke Tonachel, director of clean vehicles for the Natural Resources Defence Council. "The standards automatically adjust to the sales mix of vehicles," he said. Auto executives attending the meeting included Marchionne, General Motors CEO Mary Barra, Ford CEO Jim Hackett and Bob Carter, executive vice-president of North America for Toyota.